Liz's Paper Loft: MCT July Release Blog Hop ~ my thoughts are with you! MCT July Release Blog Hop ~ my thoughts are with you! If you're ready to hop then you should have arrived here from the talented Miss Kim. Or if you just happened to pop in to see me, you will want to head over to our fearless leader Miss Emma! For my card I used the new set My Thoughts Are With You. I decided not to use a sentiment yet, so I can stamp one inside when I'm ready to use it. I thought this card could be used for several occasions. I added wink of stella, stickles, and glossy accents. Friday, July 17th, 2015MCT 45th Edition Release Blog Hop! So beautiful! 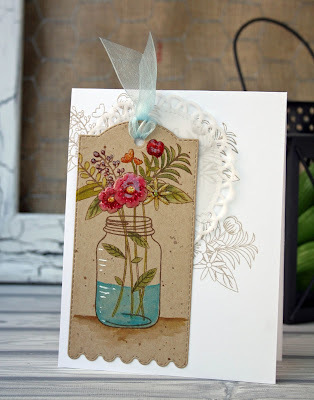 The flowers and jar are so pretty stamped and painted on the kraft! Okay, this is GORGEOUS lady!!! You just inspired me to use my million bottles of stickler again! hehehe! Thank you for your AWESOME sneaky peeks this week!!!! Wow Liz your card is beautiful! Love the tag, so elegant! Very beautiful card---love the back ground that you did. Thanks for a great week!!! Stunning job with this project! I love you used the Kraft card stock as a base paper it just adds a different pop to the whole look. Thank you for a fun week! Wow, that card is so beautiful. You could use that one for just about any occasion. Thanks for all your wonderful projects this week. OMG What a Gorgeous Vintage looking card. I am in awe of the look you achieved. Your creative ideas are abounding. Great ways you used Miss Emma's goodies & Your painting is amazing you so created a work of art which is totally frame worthy!! Very lucky person who receives your card!! There are so many things I like about your card. 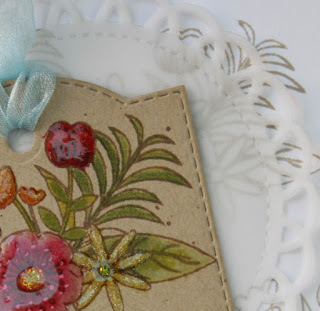 The painting on your tag is beautiful...the background stamping in kraft to accent the tag and the doily! I also like the touch of blue with the ribbon. The design of this card is an eye catcher! Beautiful job. How lovely is this card?! I love he contrast of the brown against the white. The colors on top of the whites. Beautiful! Liz ~ OMG ~ I LOVE this card! 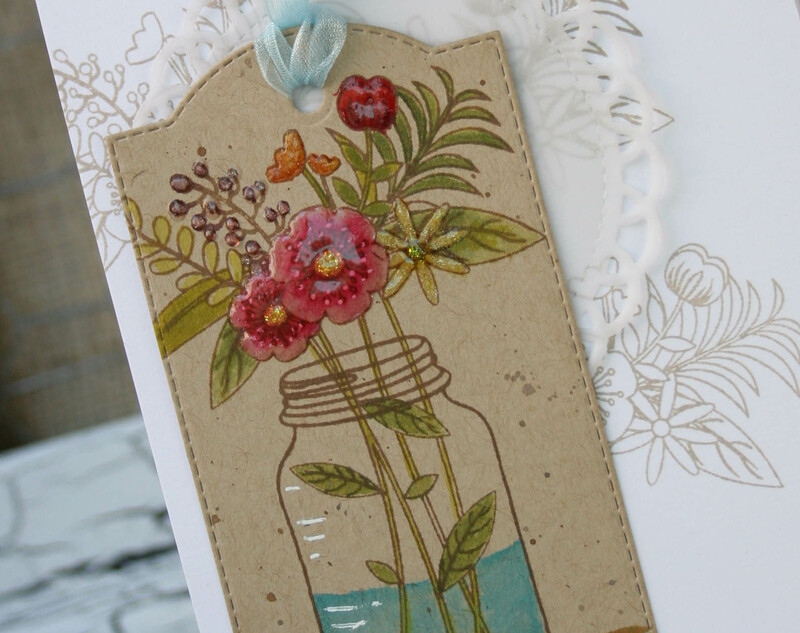 Let alone the flowers and how you did the mason jar but adding the flowers behind tag and doily ~ EEK! I LOVE that idea! SO BEAUTIFUL!!! I am going to have to steal this idea! WOW! Your card is so beautiful. Love the colors of the tag and the delicate doily. Very creative. Thank you for sharing all your beautiful projects this past week, enjoyed all of them. I love the panel added to the embossed base. Love how the kraft cardstock looks with all the flowers. supper cute!!! Beautiful card! Love how you used the stamp for the background design as well. You did an incredible job on this! This is so beautiful Liz! I love the mason jar of flowers and fun background! Goreous card Liz! Loved all your projects this week! Your card is stunner and so beautiful!!!! I love, it's my favorite on this hop! Beautiful--I like the coloring on kraft. What a unique design Liz! It's absolutely gorgeous!!! Very pretty! I adore the background stamping too! It really allows those flowers to pop on the card even more! Love it! WOWZERS Liz!! This is gorgeous!!!!!! What an elegant card. Simply beautiful! I just love your project. I love that you did the image on a kraft tag. So pretty. Liz,this is so beautiful! Love the kraft and how you stamped the background! Beautiful job!!! Your card is beautiful and really could be used for so many occasions. Love it. Thanks for sharing. Gorgeous card Liz! This set is fabulous and you did an awesome job showcasing it!TFS! Thank you for such a beautiful elegant inspiring card!